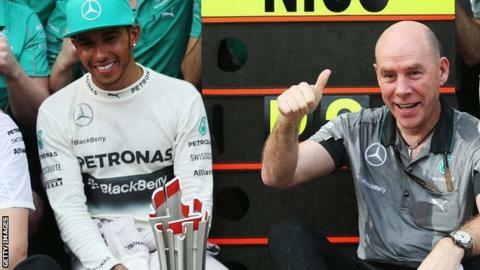 One of Lewis Hamilton's key technical staff at Mercedes is to leave the team and move to Ferrari. Jock Clear, Hamilton's senior performance engineer, will effectively be the replacement for Pat Fry, Ferrari's former engineering director. Fry was sacked this week as part of a purge of senior personnel at Ferrari as they seek to arrest years of decline. Clear is to lead Ferrari's track-side engineering once he has worked a lengthy notice period with Mercedes. The 51-year-old handed in his resignation immediately after the final race of the season at the end of November and has a 12-month notice period. It is unusual for F1 engineers to work out their full notice and an accommodation is likely to be reached with Ferrari over the coming months. Clear continues to work for Mercedes, who will assess how to reorganise Hamilton's engineering staff in the new year. He is likely to be moved away from his current role, which focuses on the cutting edge of performance, given that he is to leave for a major rival. Clear, who has previously worked with former world champions Michael Schumacher and Jacques Villeneuve, had been at the team for 15 years. He joined British American Racing alongside Villeneuve, with whom he had worked at Williams, when the team were founded in 1999 and stayed through the team's guises as Honda and Brawn and into Mercedes. His role at Mercedes was as one of three chassis engineers assigned to Hamilton's car, assisting the new world champion's race engineer, the primary contact with the driver, with data analysis. Mercedes were happy to release Clear as they were unable to offer him a role similar in seniority to his Ferrari position. Ferrari have also tried to recruit Mercedes' former technical director Bob Bell, who resigned in April and left the team in November. Bell, 56, had been lined up for a senior role at Ferrari but is said by insiders to have been unable to take it up in the immediate term because of personal issues. Meanwhile, former Ferrari driver Fernando Alonso has taken his former race engineer Andrea Stella with him to McLaren for next season. McLaren refused to confirm or deny the move, and it is not year clear exactly what role Stella will take with the team.